The 16th president of the Philippines prohibit the demolition of illegal settlements on his administration. 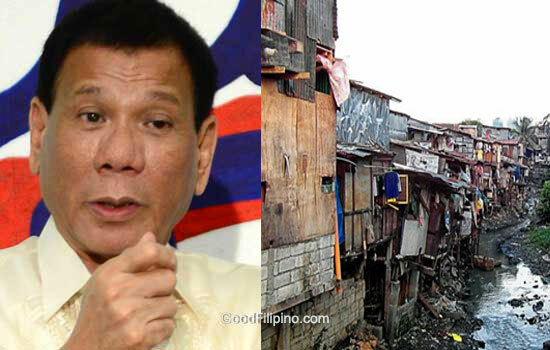 President Rody Duterte promised to all informal settlers that the government will not be evicted them from their houses unless they've given the right relocation. Duterte told to reporters in Davao City, "Simula ngayon, walang tao dito sa Pilipinas ang i-evict mo or i-demolish mo hanggang walang malipatan," as he promised that to all Filipino with 'no permanent address' specially on Metro Manila. Duterte added that he had informed real estate developers to allocate a budget for the relocation of residents who will be affected by their condo/building projects. He encouraged other local governments to do the same. "That's the drill in Davao. So why don't you just follow it also?" he said. In his interview on radio dzMM last December, He said, "Itong relocation, would need, siguro, a 20-year plan. Hindi ito pwedeng isang presidente na six years lang. Gagawa ka ng satellite cities, o paglipat mo 'yung mga industries to decongest Manila. But you have to build economic activity of a certain place. 'Pag walang trabaho, babalik ng babalik 'yung mga tao. Eventually, 'yung binigay mo na lupa sa relocation, ipagbili niya 'yan tapos babalik siya at maghanap ng pwesto dito,"
"Kung saan mo ilagay 'yan sila, there must be an economic activity. Kasi 'pag hindi, hindi 'yan pupunta doon, babalik nang babalik 'yan. Hindi mo mahinto 'yan," Duterte added. The incoming president also noted that informal settlers should fear the government to make them follow the law. Duterte give an example to the illegal settlers living along the river in Davao City. "I will remove you from where you are, and I will send you doon sa housing na nilagyan ko ng palengke. That's your penalty. "Kailangan matakot talaga, sumunod. Ang problema kasi, walang sumusunod. Kailangan kapag sinabi ni Duterte na sundin mo 'yun, isang salita lang," Duterte said. What do you think on Duterte's plan for the illegal settlers on Metro Manila? Share your thoughts below. Comments or suggestions about "Duterte promise to Informal Settlers: 'Walang demolition kung walang relocation'" is important to us, you may share it by using the comment box below.